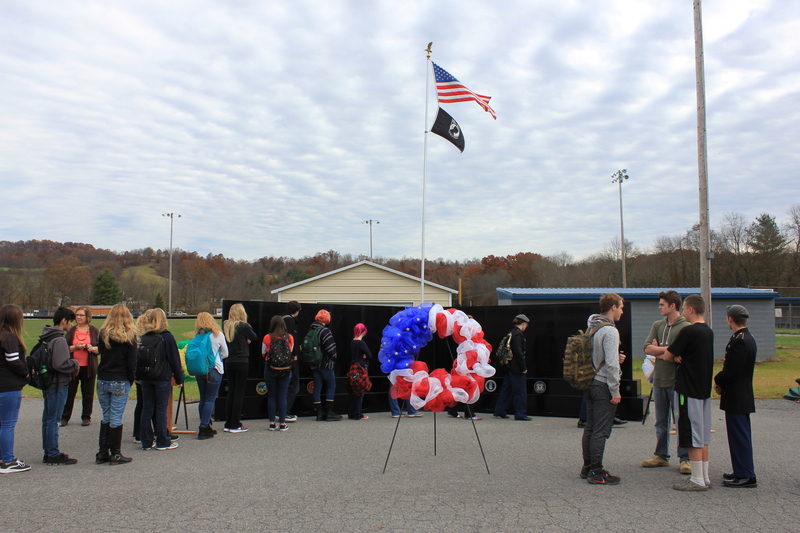 One day, the NCHS JROTC was in the middle of their drills when a lost truck found its way to them. After talking to the two men who were inside the truck, Sergeant Long learned that they were veterans who travel with a wall designed to memorialize those who lost their lives during the Vietnam War. After giving them his information, Sergeant Long set up a way for our school and community to show our respects. The students and staff had the chance during lunch to see the display and talk to the men who brought it. Donation stands were set up and everything donated will go towards travel costs so they can “continue to bring the communities together,” Sergeant Long says. The memorial is a tall, black, and sleek wall with the names of every West Virginian who died during the Vietnam war. “This memorial deserves more exposure, even though it was an unpopular war at home and many soldiers got disrespected for it,” says Sergeant Long. That’s why opening it to the community is a beautiful idea that will bring veterans, friends, and family together.